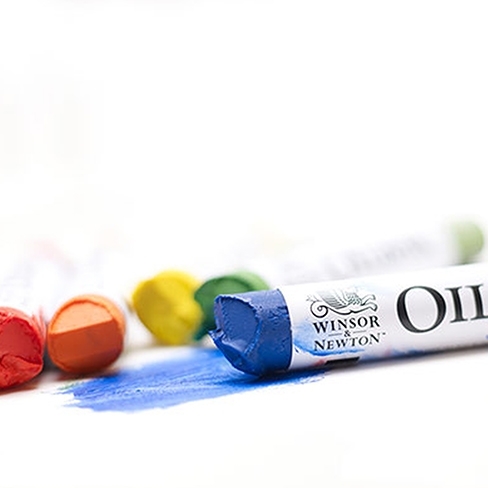 Winsor & Newton Oilbar represents the exciting possibility of drawing directly on the canvas with wet colour. They combine the buttery consistency of oil paint with the freedom and immediacy of charcoal and pastels. Don’t mistake them for oil pastels, though - Oilbars are made to a special formulation of linseed or safflower oil and wax. You can use them on their own or with tube oil colour and there are 50 tones to choose from. The high level of pigmentation provides strength and depth of colour, superior in every way to oil pastels or crayons. Oilbar also has the physical advantage of producing a dry film, as opposed to oil pastels, whose binder cannot be fixed, leaving colours to smudge or pick up extra dirt. Working with Oilbar is expressive and immediate; nothing comes between the artist and the surface. Not even a brush. The 50 colours, including a colourless blender, are an excellent spectrum for using Oilbar by itself or in combination with other oil colours. The Oilbar range is formulated with pigment, linseed oil, or safflower oil with a blend of specially selected waxes. As with all Winsor & Newton colour products, every colour in the Oilbar range is individually formulated to take advantage of the natural characteristics of each pigment and to ensure stability of the colour. Artists’ Oilbar has a consistency all its own, making for truly unique, dynamic applications. When an oil medium is added, Oilbar handles comparably to a tube oil colour. As each pigment requires differcing volumes of oil in formulation, the surface sheen of Oilbar may differ slightly from colour to colour. The addition of solvent, as well as the use of additive mediums will alter surface sheen, as well. Artists’ Oilbar has the same ratings as other Winsor & Newton artists’ quality ranges. AA and A rated colours are recommended as permanent for artists’ use. Please refer to the permanence ratings provided on the printed colour chart and the tube labels. Drying time. Once on canvas, the colours will become touch dry in 2 to 7 days. Thorough drying prior to any varnishing is essential, and should be a minimum of six months in thin films of colour. Longer periods are necessary for thicker films. The Colourless Oilbar is the equivalent of linseed oil in tube colour, and is used mostly for blending and glazing colours directly on the canvas. It serves as a medium in solid form. Oilbar can be used with both traditional oil colour and Griffin Fast Drying Oil Colour. Due to the wax content, thick Oilbar films are not recommended underneath thin oil films. Doing so would contravene the “fat over lean” rule. Oilbar is also compatible with all Winsor & Newton oil mediums. Finished artwork made with Oilbar requires protection from dirt and grime. Ideally, pictures created with Oilbar should be framed behind glass, as the wax content can affect varnishing. There are a wide variety of applications for which Oilbar is well suited, and the product has proven to be particularly popular with printmakers for monoprinting. Oilbar can be used directly on a glass plate, with or without medium, for direct transfer to the paper.